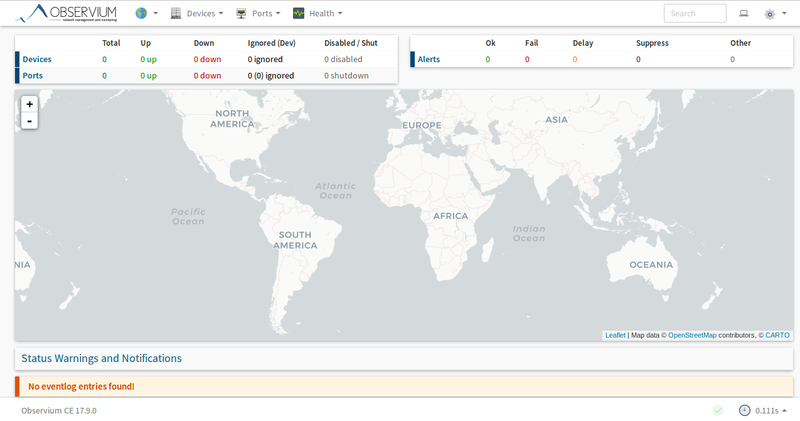 Observium is a free and open source Network Management and Monitoring tool that can be used to monitor all of the network devices. It is written in PHP and uses SNMP to collect the data from the connected device and monitor them using a web interface. Observium supports lots of Network hardware and Operating systems including, Linux, Windows, FreeBSD, Cisco, Dell, NetApp and much more. Observium provides a powerful, simple and easy to use interface to monitor the health and status of your network. In this tutorial, we will explain how to install and configure Observium on Debian 9 server. A fresh Debian 9 server installed on your system. A root password is setup on your server. Observium runs on Apache, written in PHP language and uses MySQL as a database. So you will need to install LAMP server on your system. Congratulations! you have successfully installed Observium on Debian 9 server. You can now easily get the status and health of your network. You can check the Observium official Documentation Page for more information for configuring devices, alerts, and authentication modules. I tried this install on a debian 9 install with Joomla installed and recieved a failed to start IPMI event daemon error. Joomla runs on port 80 and wanted to run Observium on port 3000 in virtual hosts but cannot get the install to work. To remove I want to run apt-get purge --autoremove but cannot figure out apt-get name to remove. jan 02 15:16:32 debian systemd: Failed to start IPMI event daemon. jan 02 15:16:32 debian systemd: ipmievd.service: Unit entered failed state.